I remember when Kurt Cobain and Co. broke onto the mainstream music scene with their mesmerizing and energizing song Smells Like Teen Spirit. I (like millions of music fans) was instantly hooked. Their entrance heralded the way for other Seattle based exports like Pearl Jam, Soundgarden, Amazon.com and Starbucks. 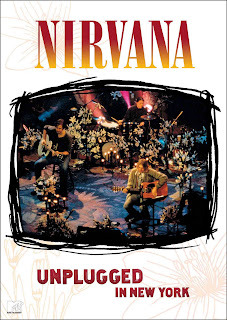 One of the highlights of the groundbreaking grunge band's brief career was the acoustic set they played on MTV's Unplugged recorded on November 18, 1993. Now, fourteen years later, the DVD of that performance has been released. It features not only the MTV airing, but the unedited version of the performance as well which includes the songs Something In The Way and Oh Me which didn't make the final cut for the televised program. Also included are the band's warm-up and sound check which gives a more intimate insight into the band and MTV's Bare Witness, a pseudo documentary of the event, which feels as forced and artificial as the rehearsals are loose and genuine. Nirvana broke the mold of the typical Unplugged performance by compiling a unique and eclectic set list for the show. The only real "hit" included was their song Come As You Are, although they also stayed in more familiar territory with All Apologies and Dumb. But for the most part they defied expectations by including lesser known or even unknown tunes as well as some odd covers by artists such as Vaseline (Jesus Don't Want Me For A Sunbeam), Leadbelly (Where Did You Sleep Last Night?) and three Meat Puppets songs (Plateau, Oh Me, Lake of Fire). In fact, the Meat Puppets were featured as special guests during the performance (God, I love that name--Meat Puppets. Sounds tasty and fun at the same time...) . My favorite cover--favorite song of the set, actually--was Nirvana's rendition of David Bowie's The Man Who Sold The World. Also appearing with band members Kurt Cobain, Krist Novoselic and Dave Grohl (who came from the D.C. area just like me!) were second guitarist Pat Smear and cellist Lori Goldston. The show aired on December 14, 1993--just four months before the sad and untimely death of the brilliant Cobain. Watching Nirvana Unplugged in New York made me sad and nostalgic. Watching the young and talented Cobain doing what he genuinely loved doing--playing music--makes his suicide seem even more tragic. The DVD is definitely a must-have for any Nirvana fan.